Anyone used Cheshire Shoe Repairs in Warrington for trainer spiking before? 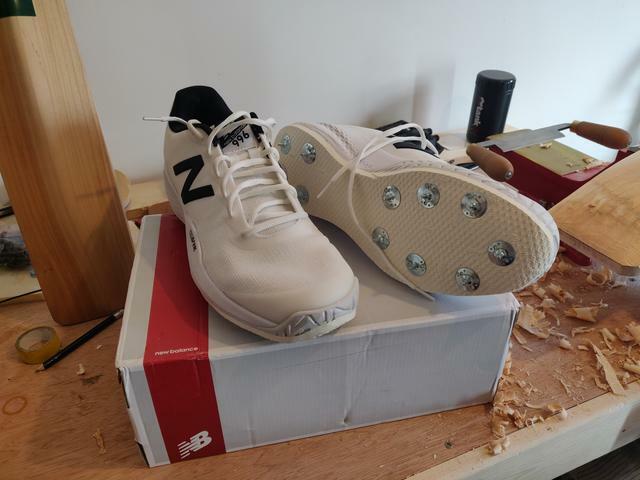 Found them online, work looks good quality and the price is very reasonable compared to the Shoe Doctor, but obvious hesistation before posting an expensive pair of trainers off into the unknown. Any knowledge on the forum? No, I haven't heard of them before. I used Gary Stanyer who runs Spyder Bats. He is based just over the border in Staffs. I have put about ten pairs of trainers through Cheshire Shoe Repairs for myself and friends over the years. Always do a good job, sole is effectively cut down and then there base glued onto it. I've never had any problems with major separation in a few seasons use. I drop off and collect and work usually takes around a week. Nice one thanks for the recommendation @ch1p - after checking with them on the phone I've already sent mine off so hopefully shouldn't be too long before they arrive back again! ...and what do you know, they turned up today! Very pleased, would definitely recommend - workmanship looks great and turnaround was very quick. They look great! Good choice of trainer. I had a pair of Adidas energy boosts done for last season and have never had a better pair of spikes. Always been tempted to have a pair of Ultra Boost done but can never find a white pair on sale and cant quite swallow the £160 plus the £38 for them to be spiked.